Those of you who follow my blog know when I get a fun idea in my head it usually turns into a party. 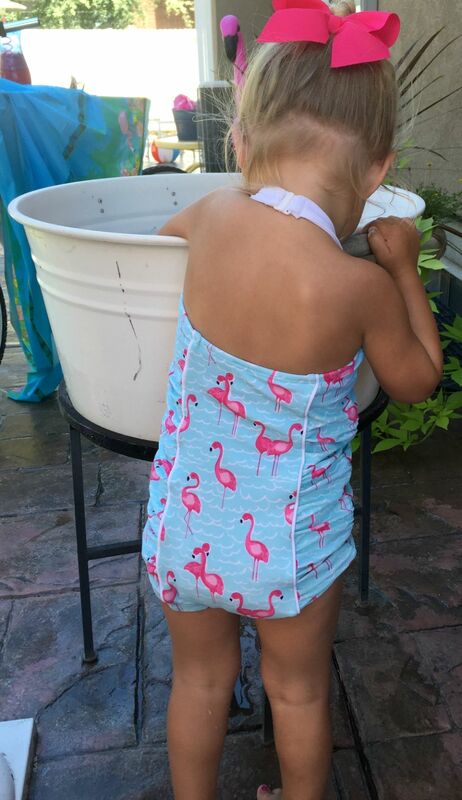 Well this time the idea consisted of flamingo’s, which all began when my cute daughter talked me into buying matching flamingo swimsuits. 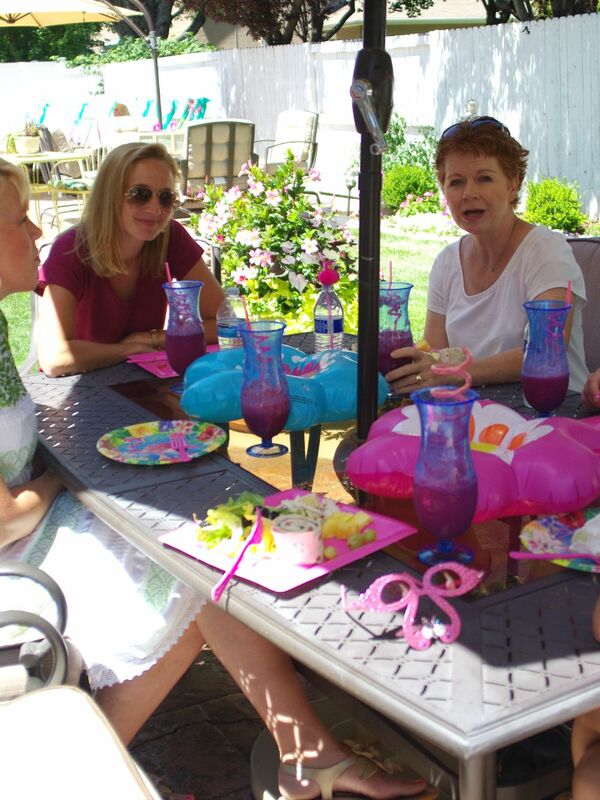 Then suggesting we have a flamingo pool party . . .
Well, that’s all the spark I needed! We had our outfits so I went to town on the invites . . .
And then began collecting flamingo’s . . . I think hubby thought I might have gone a bit overboard when this fellow arrived . . . But he’s so much fun. Friends were greeted with our new welcome matt . 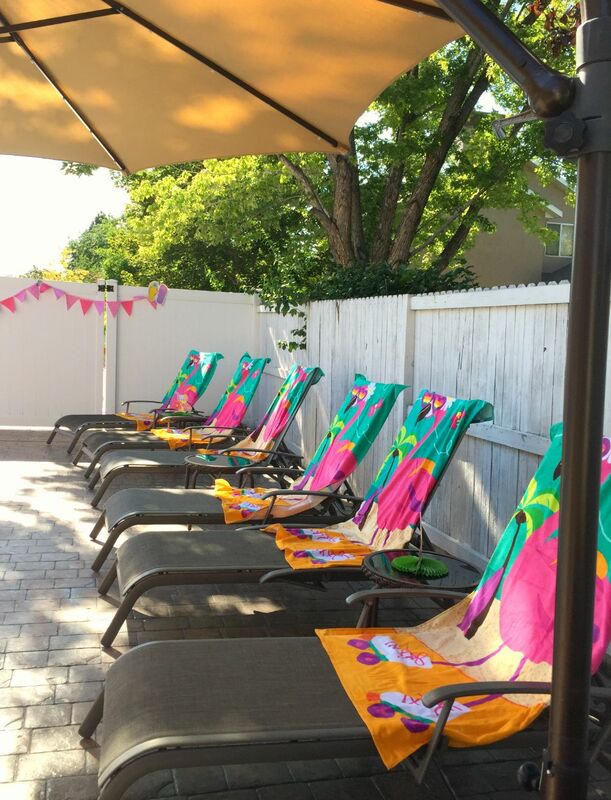 . .
And flamingo towels waiting for them . . .
And then flamingo’s popping up everywhere in the pool and yard . . . 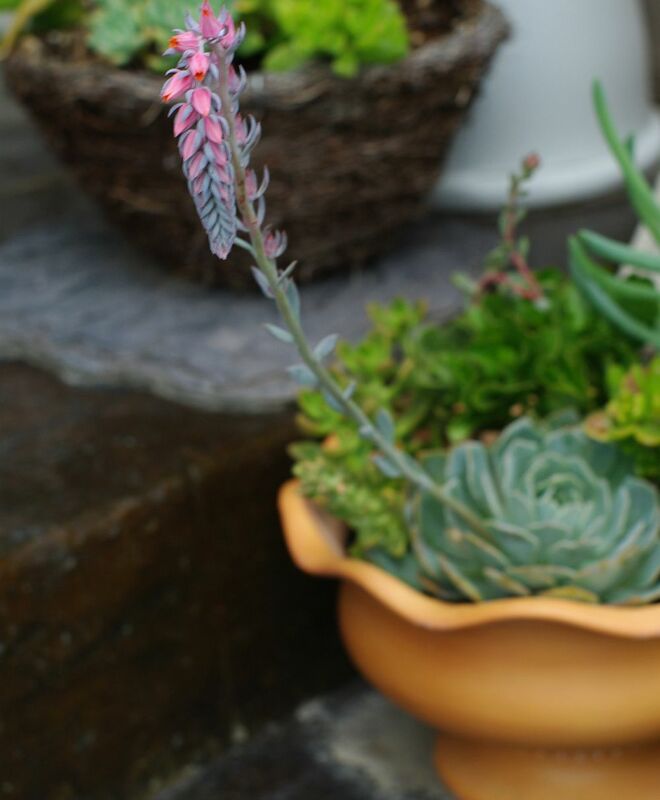 Even my succulent decided to join in. 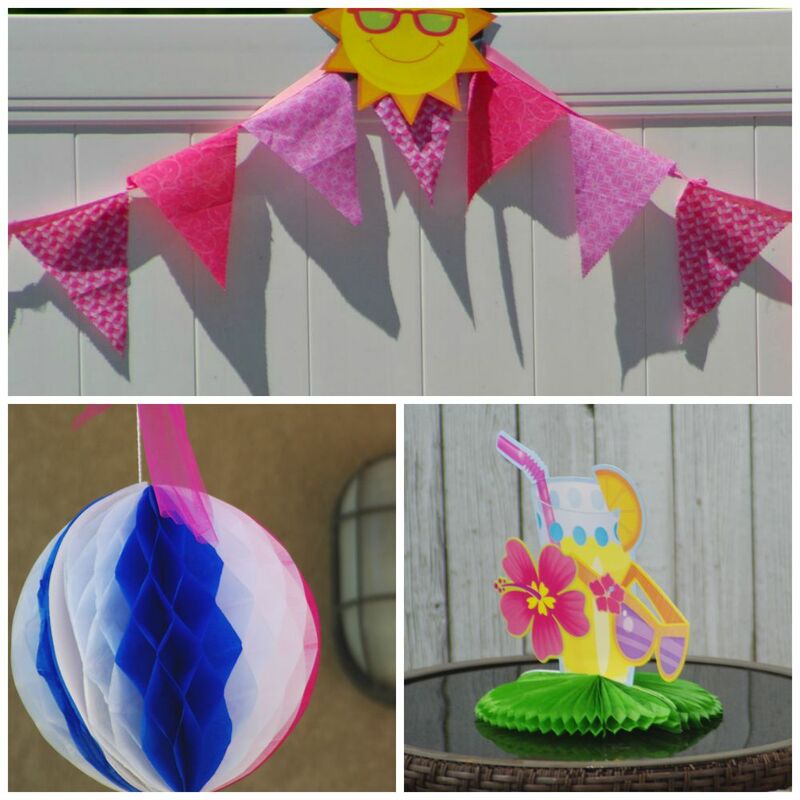 I added fun and crazy decorations throughout the yard, I mean after all it was a pool party. 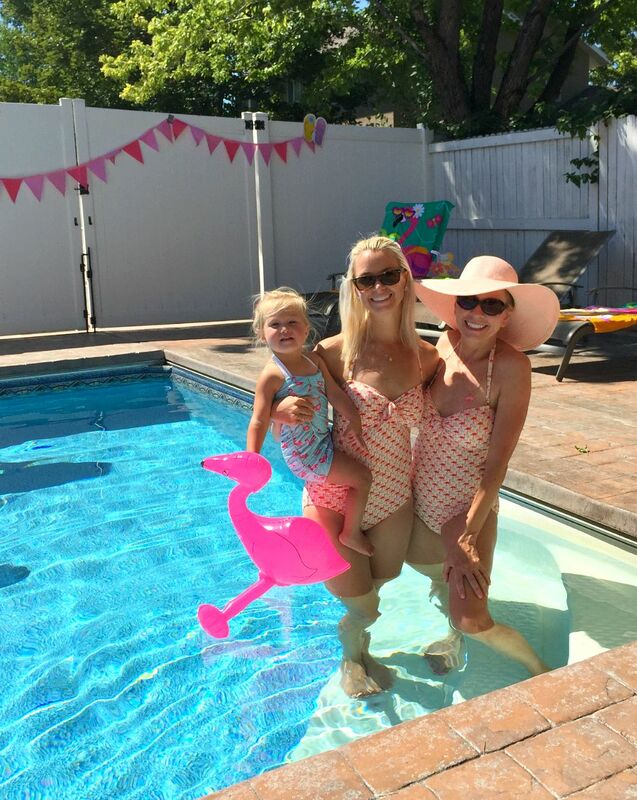 Others joined in with matching flamingo swimsuits . 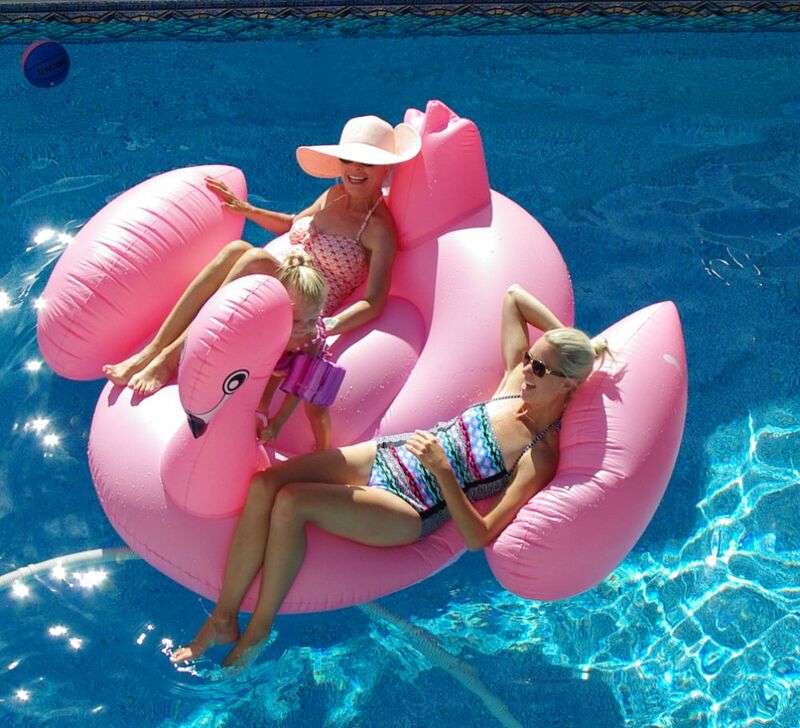 . .
and enjoying our friendly flamingo pool guest. 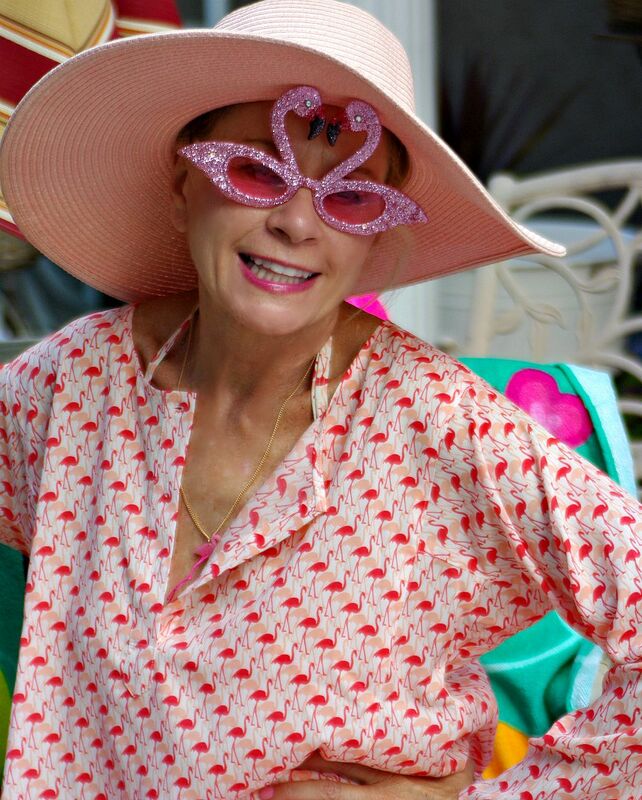 I really embraced this flamingo theme party . . . 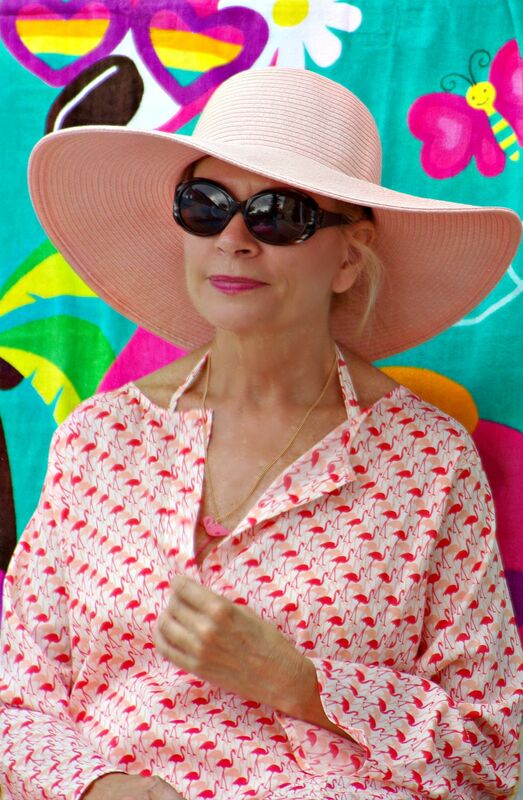 Going full out with my flamingo cover-up, sunnies, and necklace. And if you need a little Molly fix . . .
She quite enjoyed the party as well. I believe my favorite moments of entertaining is when I simply take a moment to relax and observe my friends enjoying themselves. Just another reminder of how much joy my circle of friends truly are! And Judith for her monthly hat attack. Trina, Trina, Trina! Wow. I have seen only the parties that you have shared on your blog, you are quite the party planner! 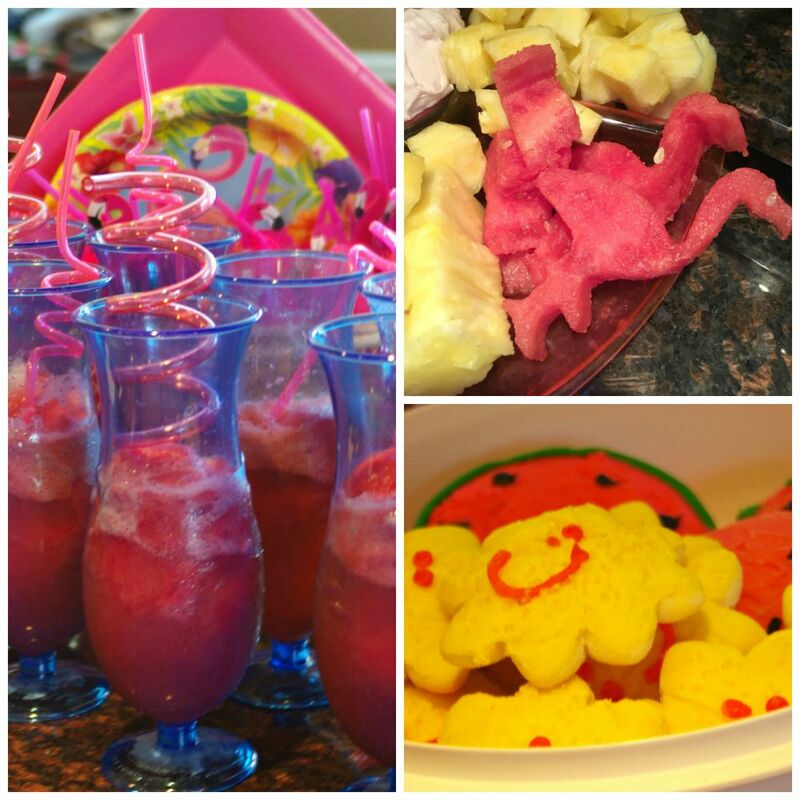 I am so impressed with the watermelon flamingos, drinks, flipflops, everytrhing themed! 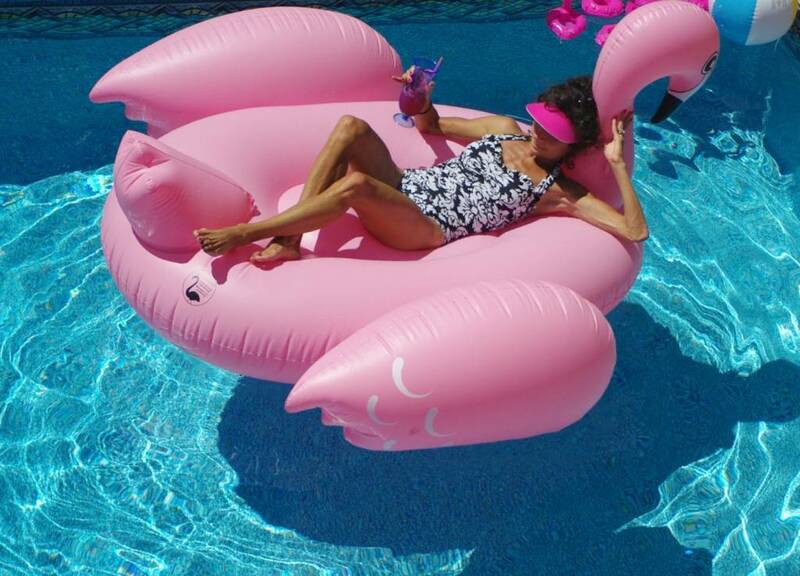 I am also envious of the giant Flamingo raft! I am on vacation in the mountains, so am on limited computer time, but I had to respond. Looks like an amazingly good time. I plan to buy one for next year, and if I was close, I would have joined you! So fun my friend.And of course, you look amazing!! I so wish you could have joined us. 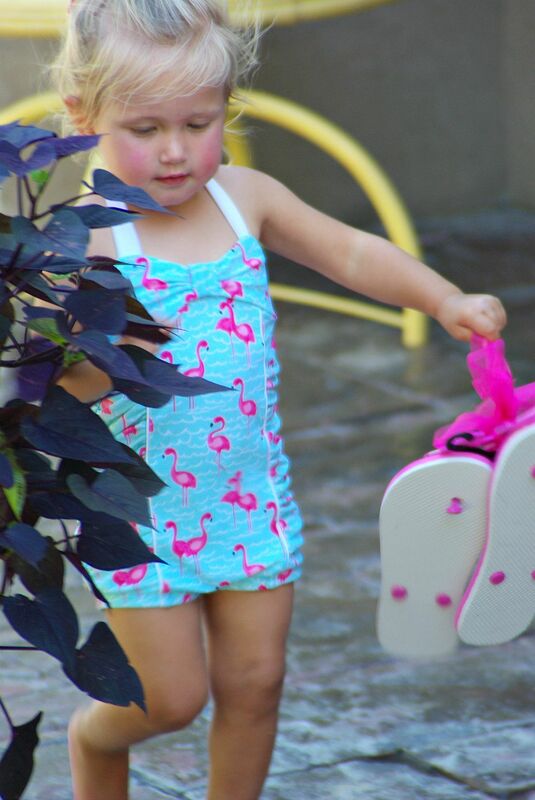 And my little (huge) flamingo pool friend is so much fun, you will love having one. Thank you so much for your kind words. Looks so cute and fun. You are so creative. Oh, thank you cute lady. It’s my form of using my creative energy, since I’m no longer playing in the classroom, haha. Watermelon flamingos?! Hahaha. Brilliant. And your glitter flamingo sunglasses? Priceless. 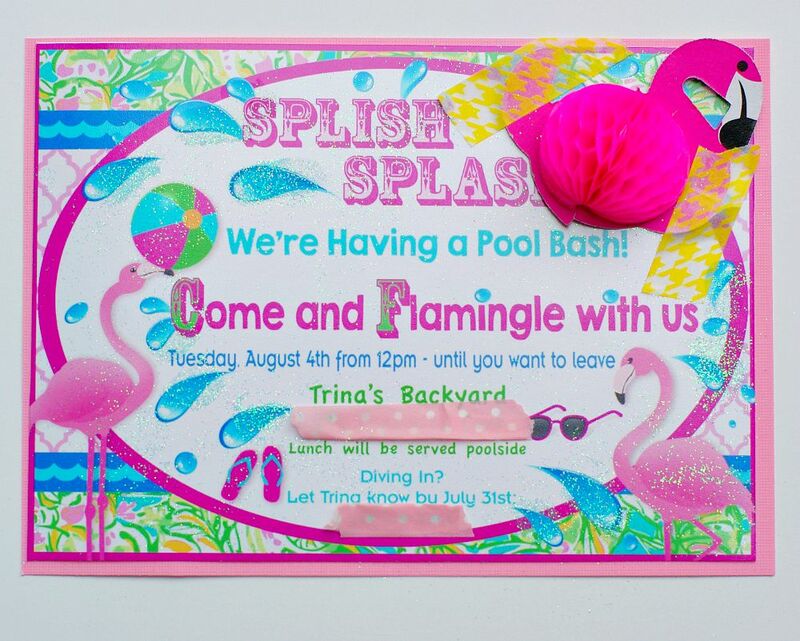 Oh, Trina, what a fun party put together with such joy. I would have had to take a spin on the jumbo pool flamingo for sure. It looks like you had perfect weather for this, but then you always do, don’t you? I’ll let you recover a while before I ask the inevitable question: what’s next?! So glad you enjoyed seeing the party since you couldn’t make it here in person. I was actually so lucky with the perfect weather day, and I mean absolutely perfect, no wind and not a cloud in sight. But today its stormy so, no, we don’t always have perfect weather. Mother nature is quite fickle here, as Par says quite often “mother nature needs her a… kicked. Taking a spin on my new pool friend is a pure delight, I’ve even finished a book while resting on his back. 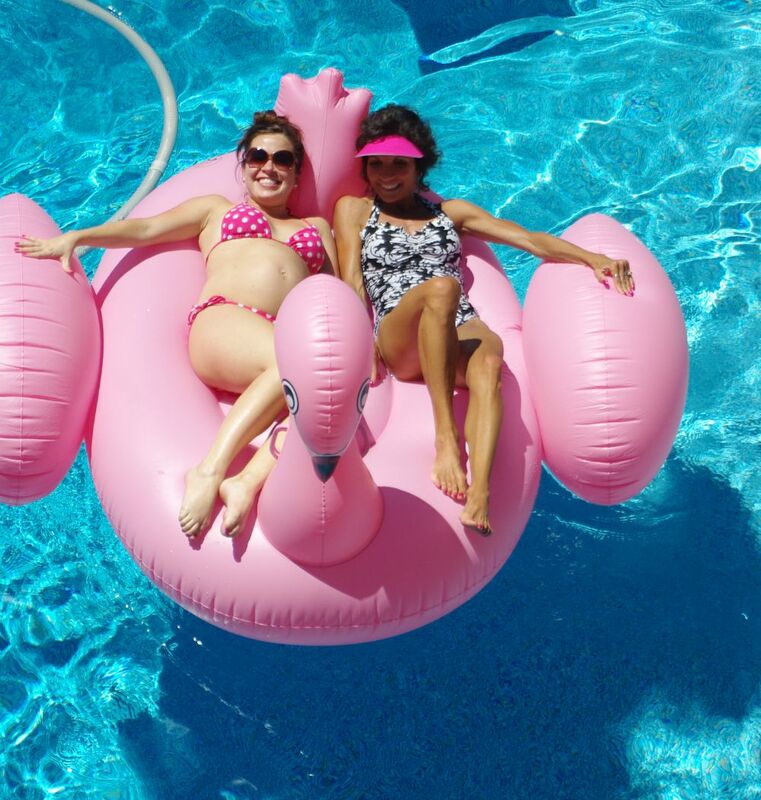 My cute (pregnant niece hashtaged #stuckontheflamingo but isn’t she the cutest thing ever with that belly (she’s due in two weeks). What’s next ??? I already have that brewing in my brain . . . “a grown up back to school party” haha. Yep, I’m on the search for vintage lunch boxes and old school lunch trays. Oh My Goodness! The first photo says it all! You three gals are absolutely adorable! And Mr. Pink Flamingo is a schtar now! 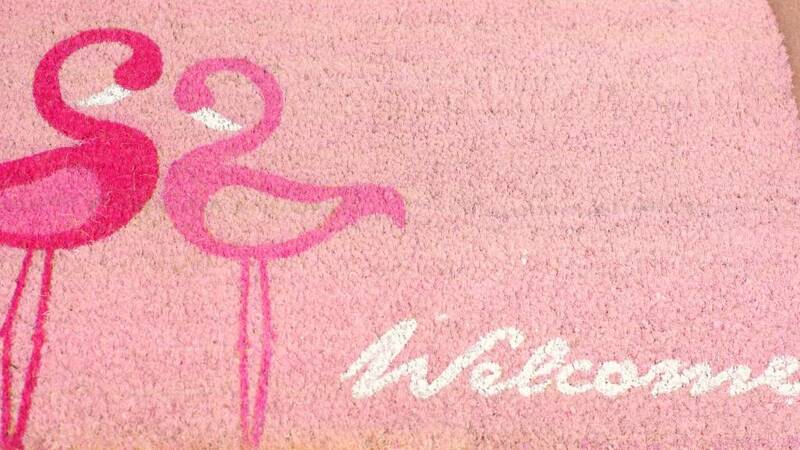 PS…i’ts pretty cool that the you not only have flamingos on towels, but roller-skating flamingos on towels! Right??? about the roller skating flamingo’s, talk about having some fun. The first photo really does say it all, I do have this much fun when my girls are in town. Wish you could join us someday. Oh how I wish I was there! What fun! It looks like the weather couldn’t have been any better as well. That masterpiece of a flamingo really is fabulous! And what wonderful photos you got. Oh how I wish you were here too. And yes, the weather was absolutely perfect, I owe Mother Nature one big hug. Let’s make that goal happen! 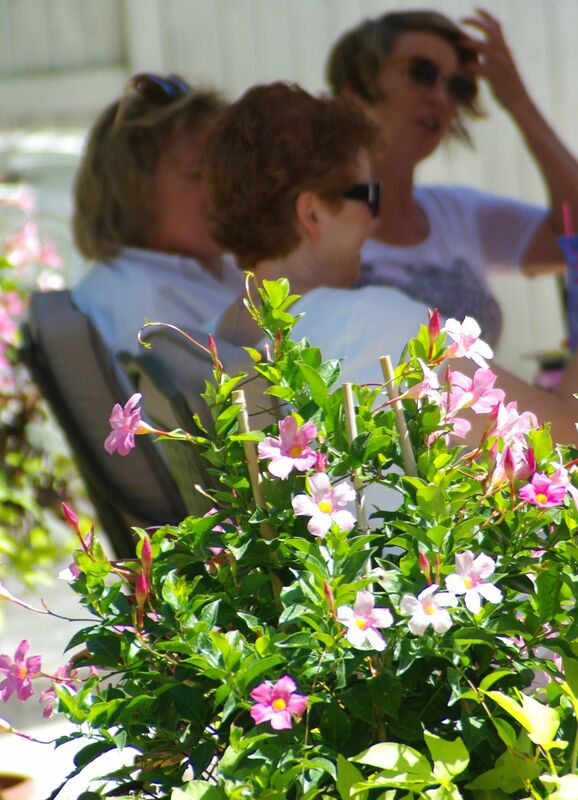 You really know how to put together a party, and it’s very apparent that all of your guests enjoyed themselves. There is beauty in every photo and Molly is adorable. I adore your pink hat and was thrilled to see you pop up on Hat Attack. Thank you so much for sharing! Thank you Judith for having such a great get together each month. Miss Molly is gaining quite the adorable personality as well, she keeps me laughing almost all day. This looks like such a fun party!! 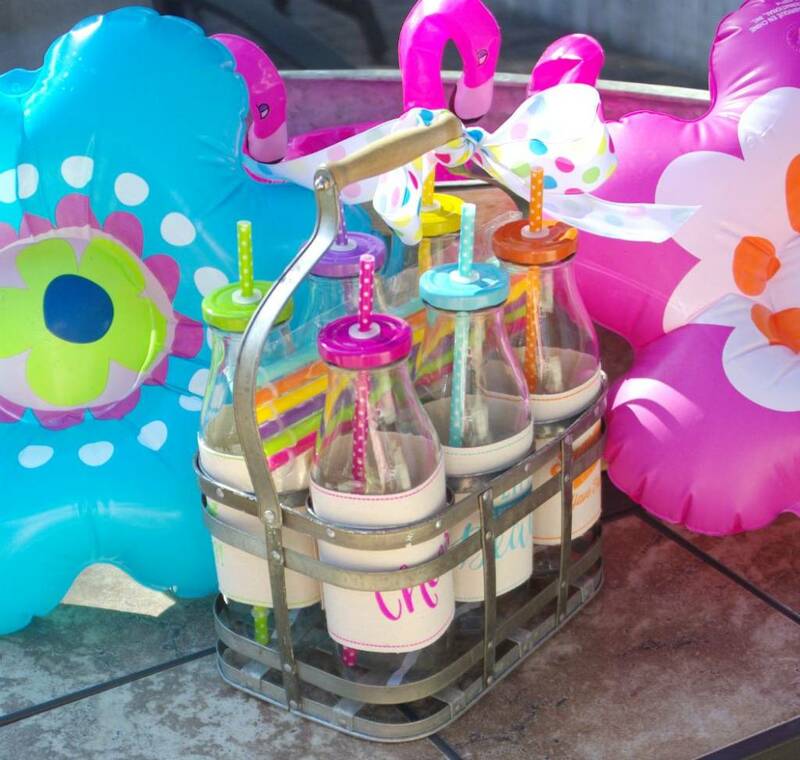 Everything is just perfect and a great theme summer party. Thank you Alice, it really was a fun party. Thank you Jo. I’m looking forward to having you join me for one of my parties. Fantastic, you really outdid yourself. I also loved the watermelon flamingos haha. Must have been quite a bit of work. What do you do with all the stuff you buy for these parties? You cannot very well keep everything? Or can you? 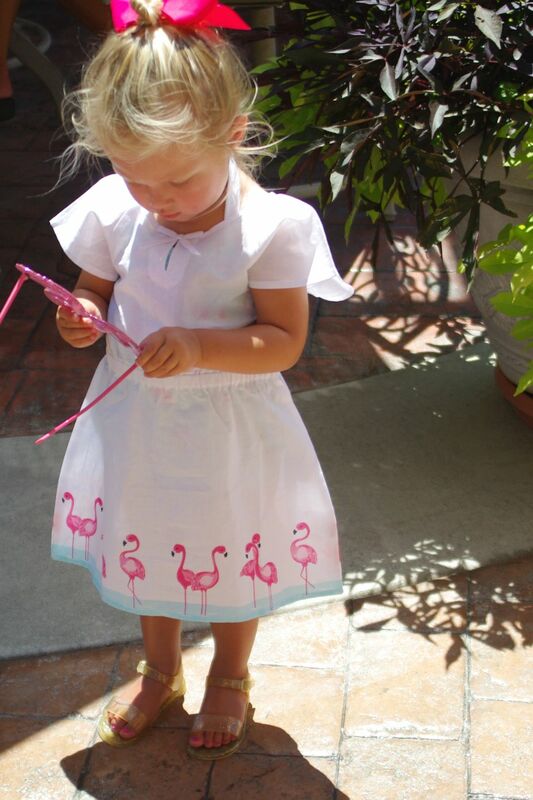 Molly is adorable in her white flamingo dress, but I also like all the matching bathing suits. So cute. As is your cover-up. Great last picture. Looking so beautiful (not really much of an effort for you though, being a natural beauty). Ha ha , the watermelon flamingo’s were actually quite easy I just used a cookie cutter. As for all the stuff . . . good question, I do try to recycle my decorations for parties. I store a lot of the decorations in big bins in a storage room in my basement (wish I had a larger one). Most of the stuff for this one will be stored with all the pool and outdoor furniture. Don’t you just love that cover-up? I have even worn it with my skinny white jeans as a top and I love it. Good purchase. I so wish you could actually meet Tori and Molly, that little Molly is getting such a fun personality, quite a character, she keeps me running and laughing almost all day. Yes, I’m completing exhausted by about 9:00 in the evenings. Oh wow! 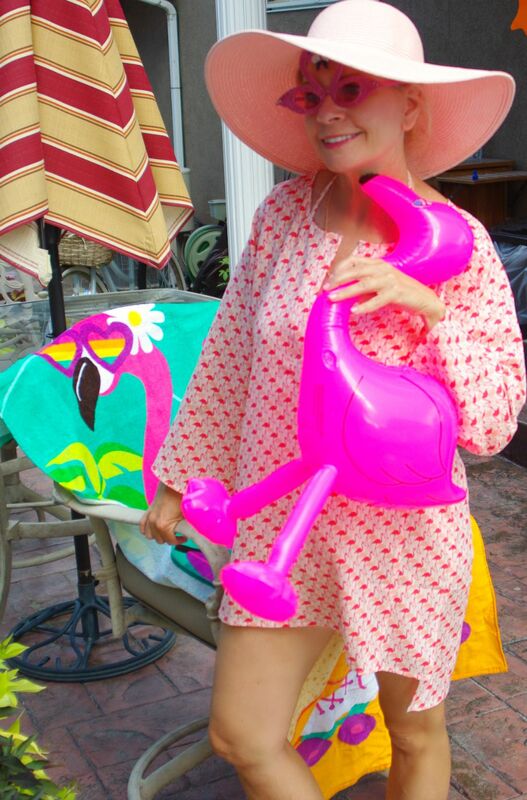 I want to flamingle now with all your flamingos, especially the giant pool one! Even flamingo towels – priceless. I can’t believe you managed to find so many flamingo themed things! Wonderful. I really think it’s a summer of flamingo’s because they just kept popping up at every corner and store I was at. 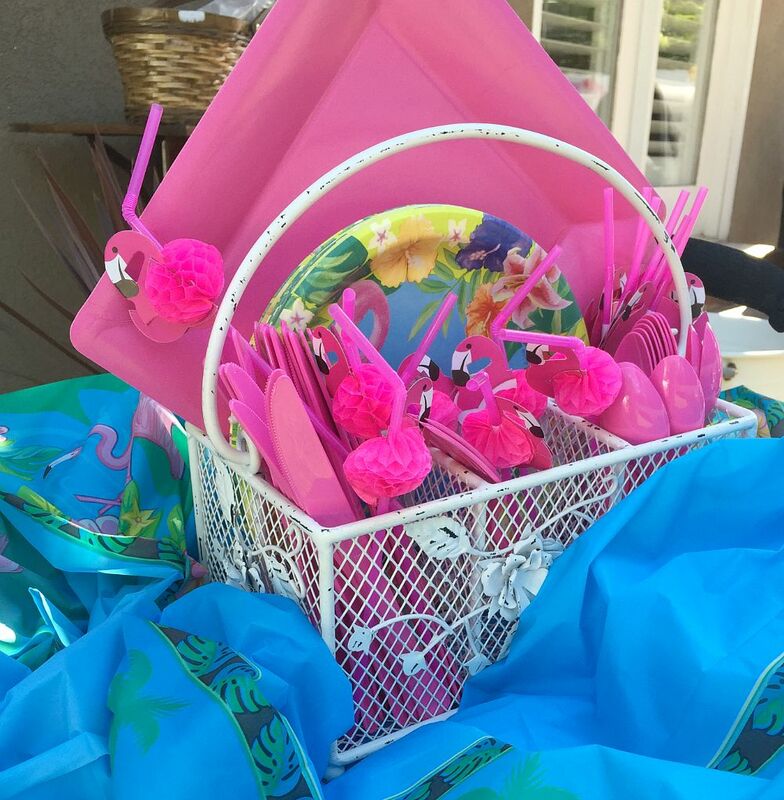 Perfect year to throw a flamingo theme party. 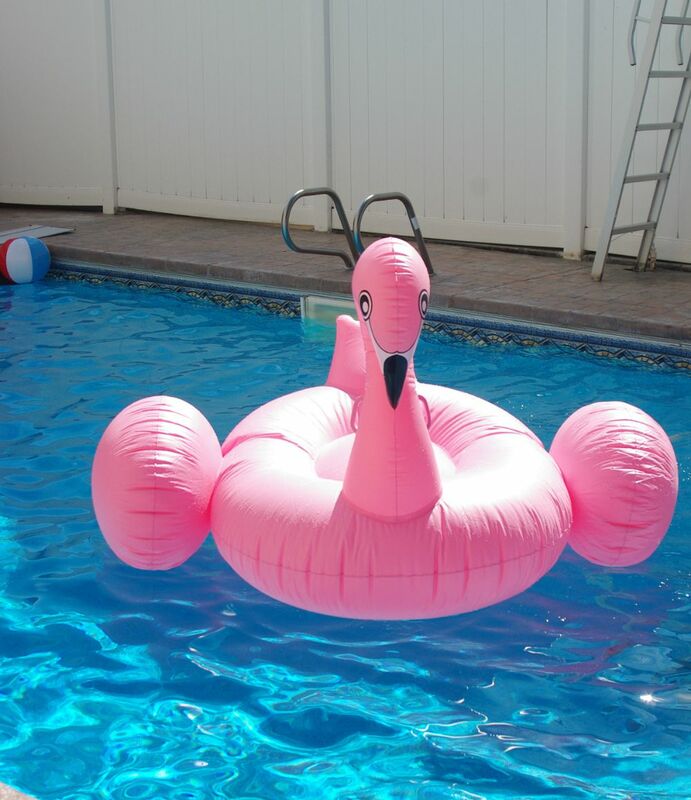 And the giant one is seriously so much fun, come on over and flamingle anytime with us. Well my friend, you have outdone yourself this time! Your suits are so darn cute and Molly, well she is just precious! 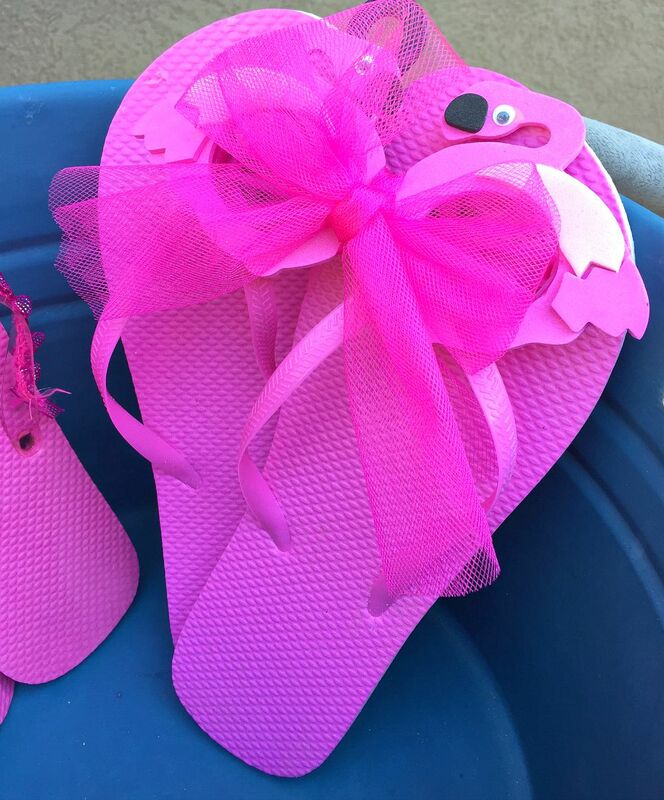 Love all of the fun flamingo stuff that you used. The big bird float is a hoot! Great gifts for your friends and I just know that they all had a fabulous time flamingling! Thanks for sharing with SYC. Isn’t he (the big bird) just wonderful, he has brought quite a lot of laughter to our back yard this season. I seriously had quite the time collecting flamingo’s this summer, but you can relate to that train of thought. Thank you for your fun get to together and for stopping by. If you’re a pool kind of gal, would you want to join me some afternoon? Adorable! You’re a party-animal. I love people who create joy in life. Thank you . . . you’re so kind. I do enjoy being creative and bringing joy to life, after all isn’t that what it’s really all about? Oh, Wendra you are so dang cute. It will become easier, I promise. It was a pleasure getting to know you and I so look forward to corresponding back and forth with you. 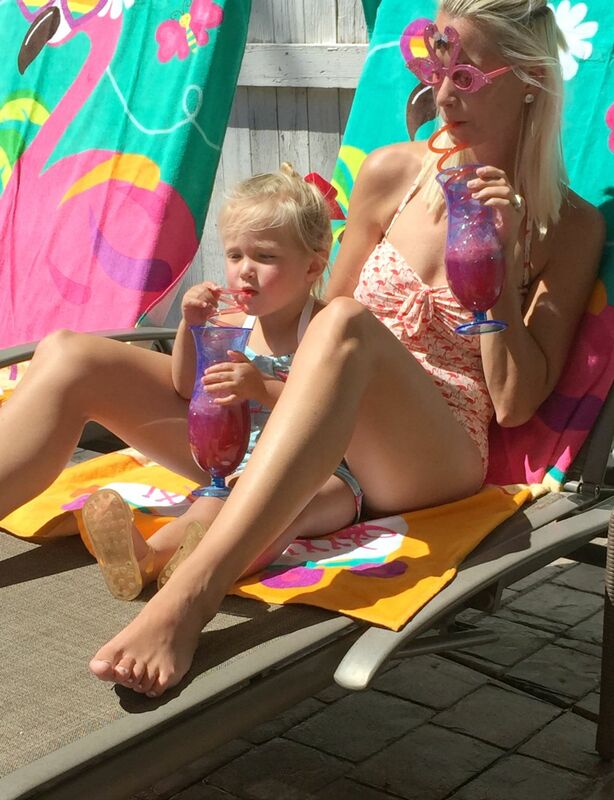 I am in love with flamingo float!!! Trina–you are amazing….talk about going all out!! Right down to the flamingo favors you handed out. You obviously know how to have FUN and create fun for those you love. Love the photos. That last one of you in the hat is a beauty. Thanks for joining our Lifestyle Linkup again–we LOVE having you! Thank you Heather, you are so so so kind. 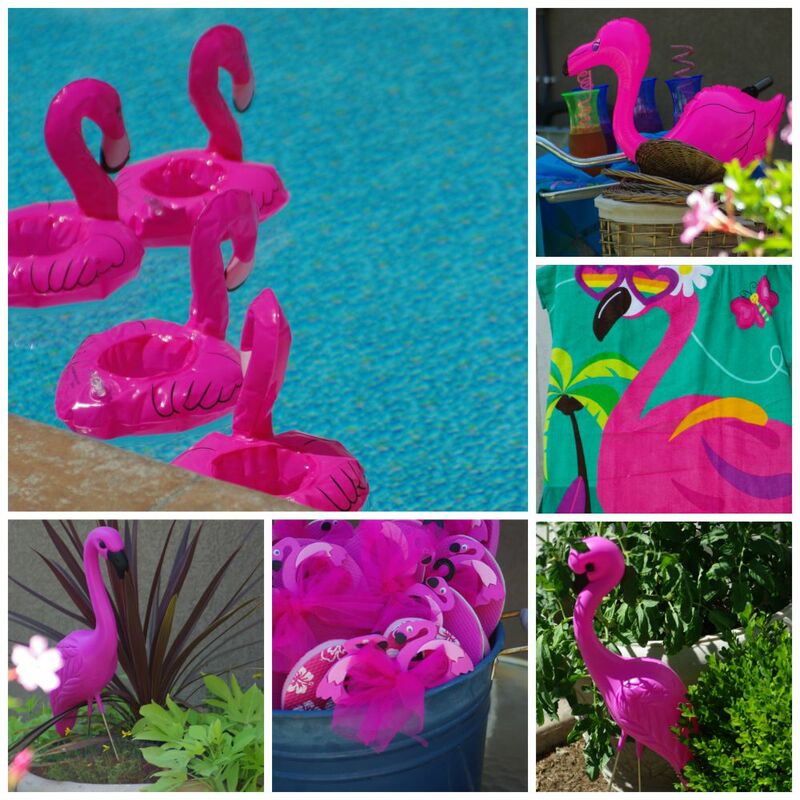 We have had a blast with Mr. Flamingo, he has brought a lot of laughter to the yard this season. Your trip looked amazing as well as relaxing and quite romantic (I wasn’t in the least bit jealous, haha). So glad you shared your adventures with us on the blog as well as instagram, I loved following along. Your blog posts are always so inspiring! I want to gather up all the flamingos I can and have a party!